My friend Kate and I invented Sandra Snowflake Day in 10th grade. It is a winter holiday that brings smiles to my friends’ faces. And, I'll be honest, questioning looks from friends who are wondering about my sanity. Sandra Snowflake Day is the last Monday of January. Celebrating this holiday requires lots of paper snowflakes, yummy sweet treats, and the realization that there is always something to celebrate. Sandra Snowflake Day was founded on the understanding that the end of January (particularly the last Monday of the month) desperately needs an occasion: A reason to have a party, celebrate the winter, and share some good cheer with friends. I admit it is a little insane to invent one's own holiday. However, finding reasons to celebrate, and taking the time to do so is the crux of The Occasionist. 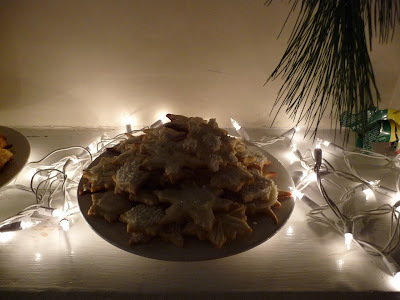 And Sandra Snowflake Day is an excellent experiment in starting traditions from scratch. This year there seemed to be a whole lot of people who needed convincing that Sandra Snowflake Day was indeed a holiday (if only in my world), and that it required celebrating. 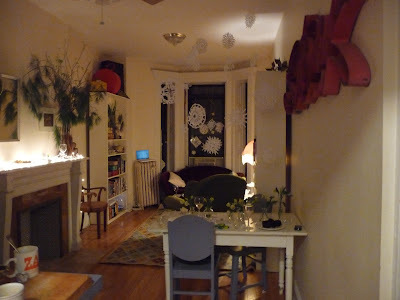 So I decided to throw a big old party, and hopefully make some new Sandra Snowflake traditions. 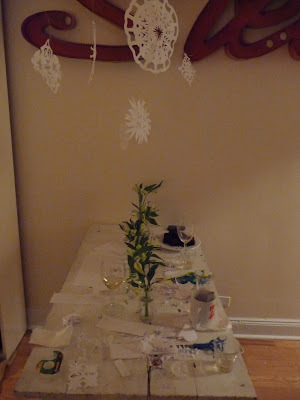 This year’s party had a little bit of arts and crafts, and a lot of white! Most of my dishware is white. 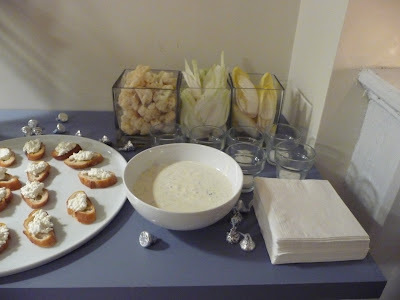 White goes with anything, and can be used for any color scheme your occasion requires. Seeing as this party’s theme was white, I had my pick of most of my dishes and tried to use different shapes and sizes. I used some more inventive containers as well. The grissini are in a metal urn, spray painted white. And the fresh vegetables are lined up in square glass flower vases. 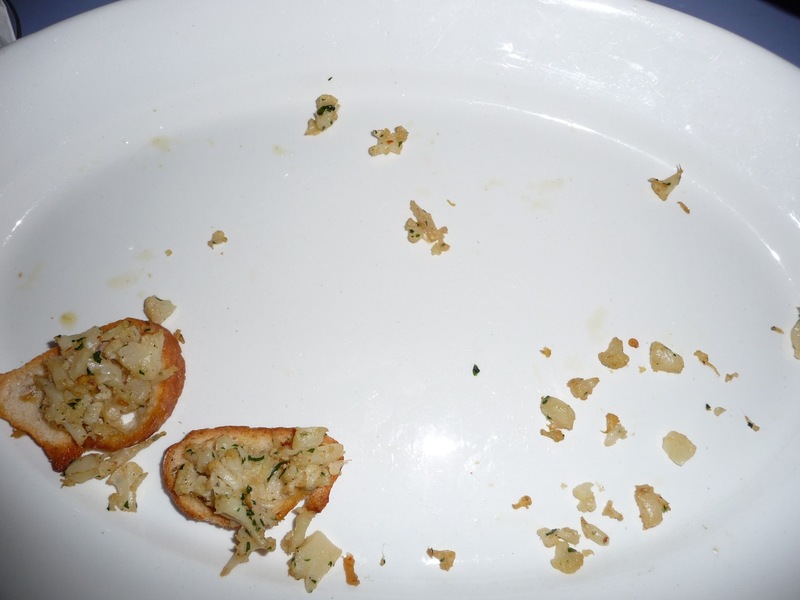 You can use any container for food (just make sure its surfaces are food safe): vases, baskets, lunch boxes. 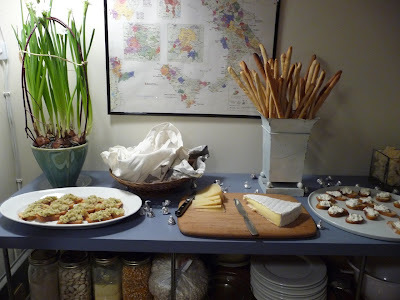 So be creative in displaying your food. 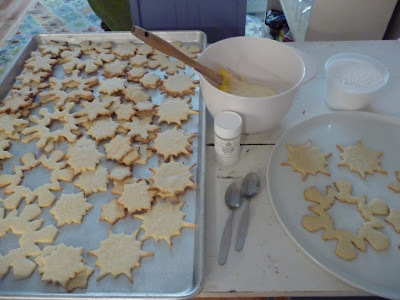 I have a set of nesting snowflake cookie cutters that I used for the sugar cookies. 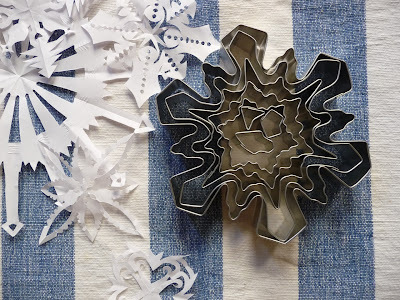 The nesting cookie cutters take up less space so they can be stored away more easily. 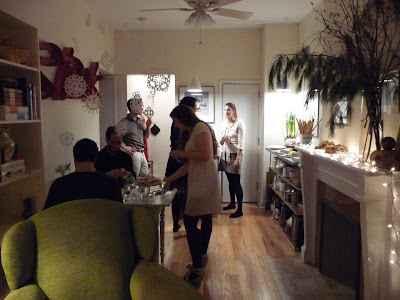 A few friends came over the day before the party to decorate cookies, drink tea and catch up. For our Winter Wonderland I hung snowflakes by fishing line over the farm table, and attached them to our front door. 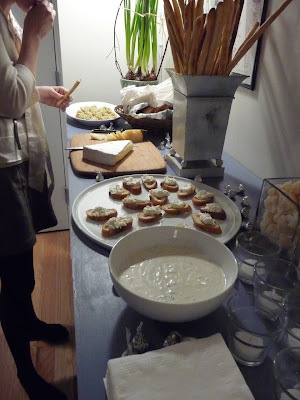 What a fantastic idea for a party and the food looks so delicious! You've won me over to the whole idea of inventing a holiday. Come to think of it, I already have a favorite day - May 10th - just because it comes at the most beautiful time of year weather-wise. I've never thrown a party to celebrate it, but I should! 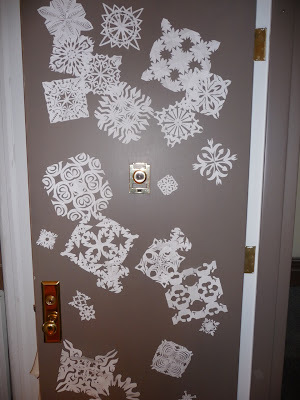 I especially love that you involved the guests in cutting snowflakes.